When you combine Anthony Bourdain‘s adventurous palate with Anderson Cooper‘s apprehension towards anything that doesn’t fall in the category of “plain,” you have a recipe for really entertaining TV. 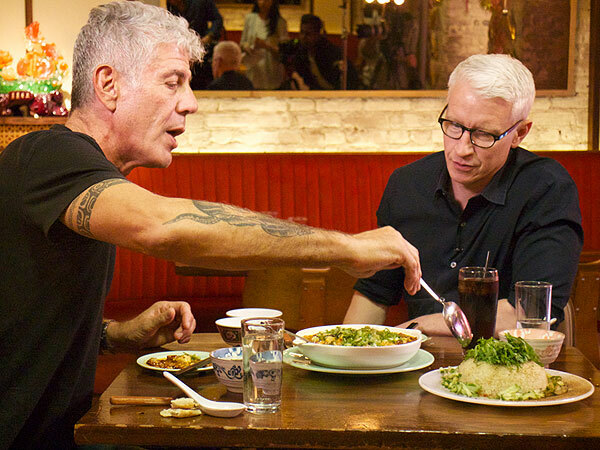 Bourdain and the CNN anchor (and notoriously picky eater) reunited at New York City’s Mission Chinese restaurant to film a series of segments on Anderson Cooper 360° to promote the new season of Anthony Bourdain: Parts Unknown. In this exclusive clip of the pair discussing Bourdain’s trip to the Philippines, the restaurant’s chef Danny Bowien brings out a tray of sea urchin from Maine—the first of many menu items curated to test Cooper’s limits. “Are these the things you’re not suppose to step on in the ocean?” Cooper asks before taking a bite and realizing he has “textural problems” with the dish. “Well, the stuff you’re not supposed to step on are protecting these things,” answers Bourdain. These kinds of questions are exactly why the chef and world traveler chose to test Anderson’s taste buds again. “It makes me happy and watching Anderson’s discomfort is always a pleasure,” Bourdain tells PEOPLE exclusively. Throughout the eight segments beginning on April 22, Cooper will also get to taste his first martini and some of the hottest wings in the city. When Bourdain brought his pal chef Eric Ripert to sample the same Chongqing chicken wings, Bourdain says he went running to the bathroom. Cooper’s immediate instinct to chug his glass of water is not as dramatic—but equally satisfying.